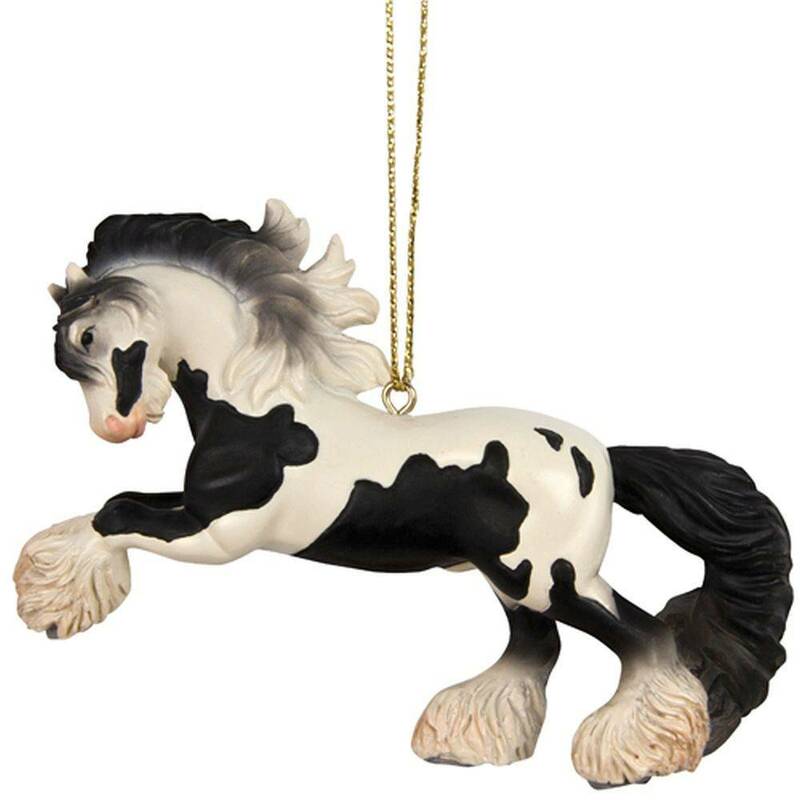 The Trail Of Painted Ponies Don't Fence Me In Gypsy Vanner displays a small draft horse, popularly recognized for their long, flowing manes, tails and lush feathers on their lower legs that swish when they move. When a Vanner stallion kicks up its heels and runs across a pasture, it all but calls out, with class, presence and style, "Hey! Look at me! I am special. I can do anything. Don't fence me in." 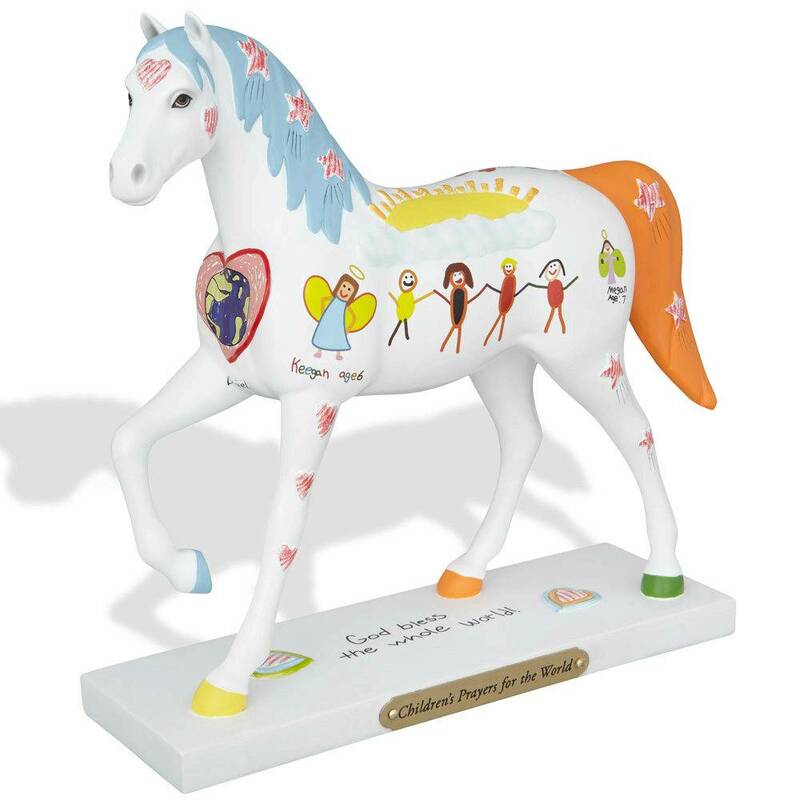 Painted Ponies Don't Fence Me In was developed in Great Britain after World War II by Gypsies who wanted to create an artistic breed of horse to pull their highly decorated and colorful caravans. Gypsy Vanners are small draft horses popularly recognized for their long and flowing manes and tails, and the lush feathers on their lower legs. Made of Resin. 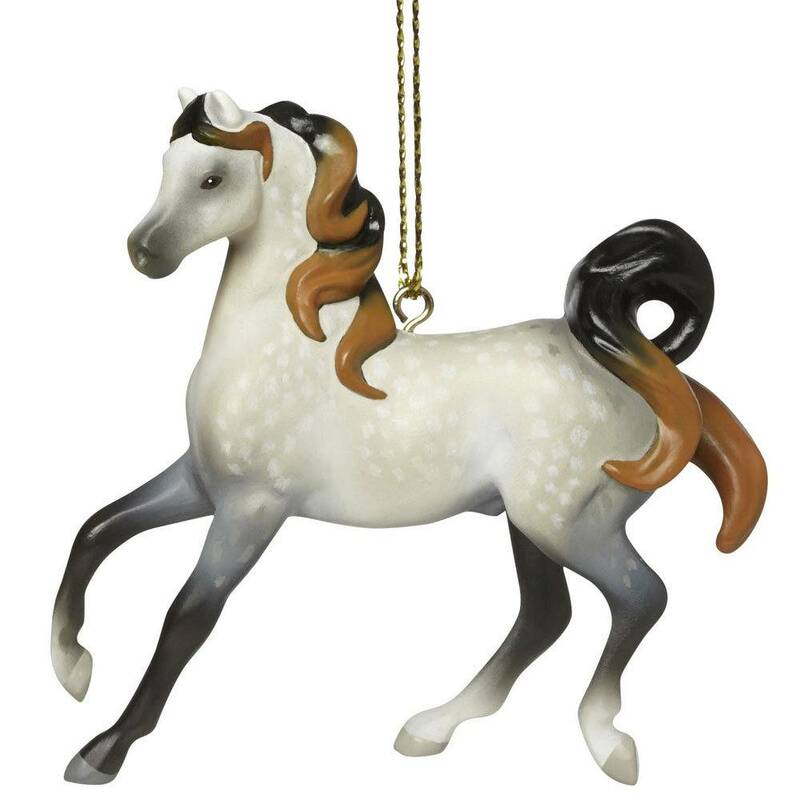 Gypsy Winter Dreams - With their long forelocks and thick manes and tails, Gypsy Vanners evoke a romance and beauty unlike any other horse breed. Made of Resin. 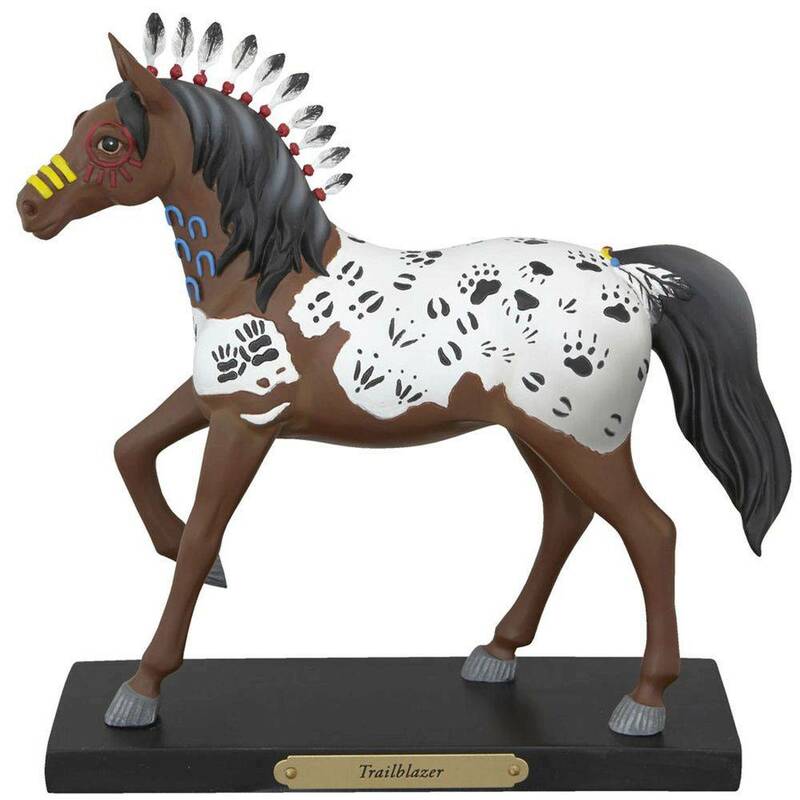 Trail of Tears Ornament is made by Trail of Painted Ponies. 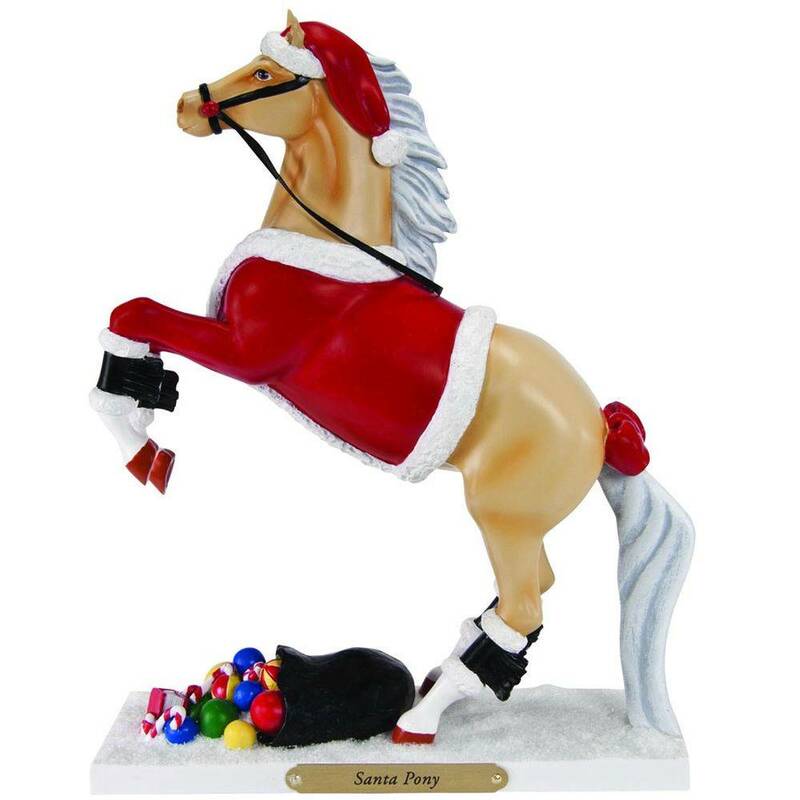 Painted Ponies Santa Pony will open up your imagination. Have you ever wondered what it would be like if Santa used a horse to help deliver toys to children around the world, in addition to reindeer? 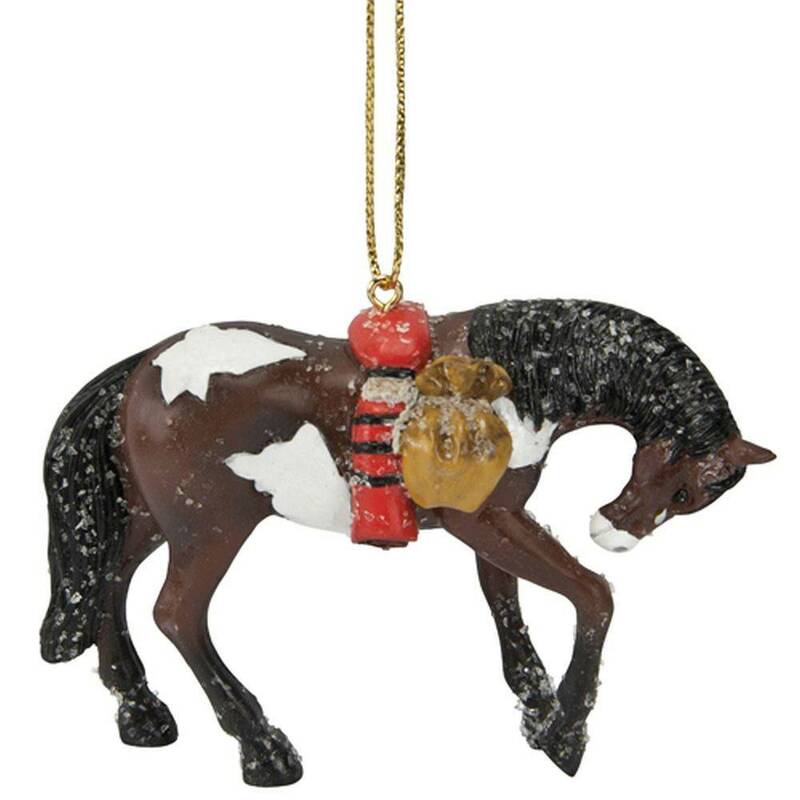 Would he be dressed in holiday finery? Made of Resin. 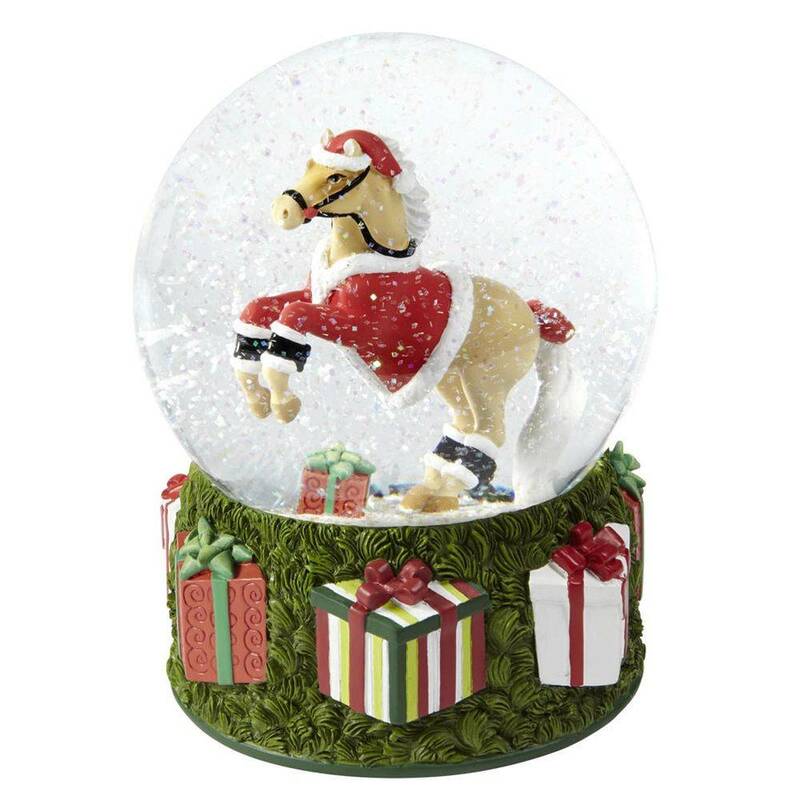 Nothing says Merry Christmas like Santas Pony Musical Snow Globe displaying Santa Claus, Music, Snow - and a Painted Pony dressed up to look like Old St. Nick himself. Made of Resin. Plays 12 days of Christmas. 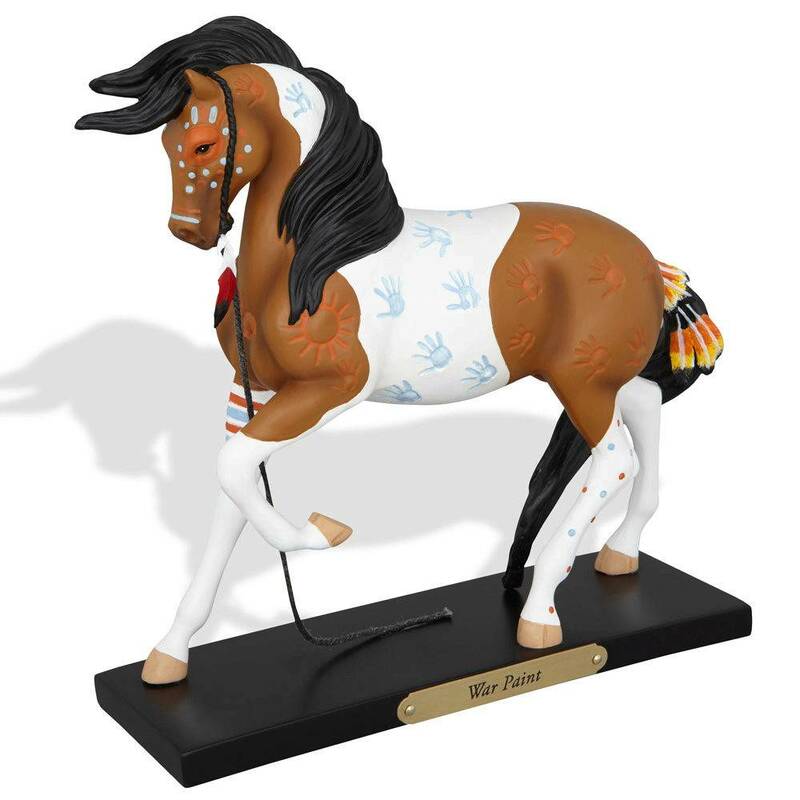 Trail Blazer tells the story of the spotted horse. 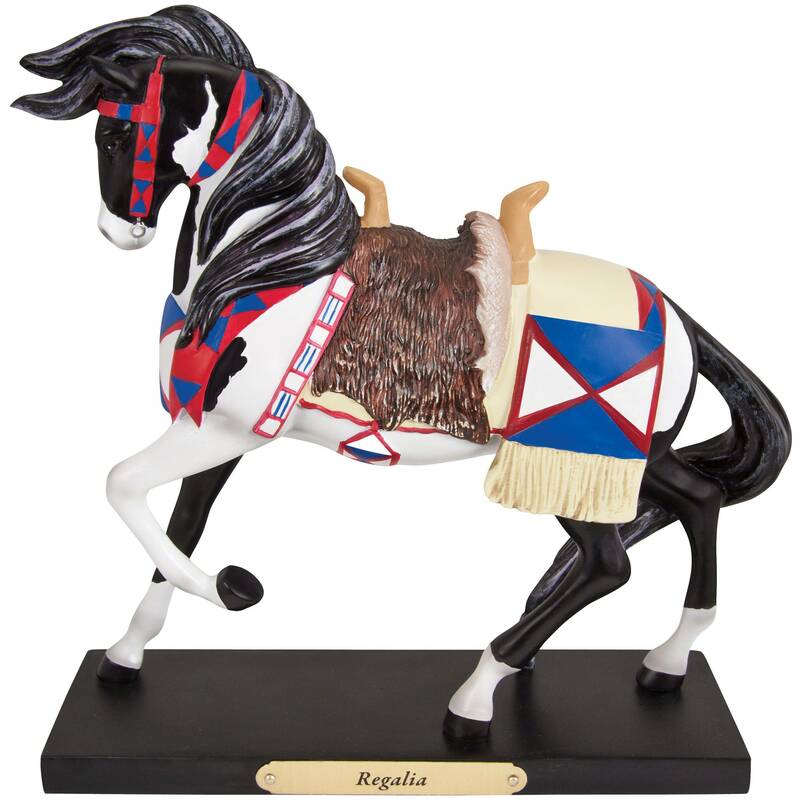 Legend tells of spotted horses that blazed trails throughout the American West. They were the constant companions of the Nez Perce, expert hunters and trackers who traveled with the seasons. Made of Resin. 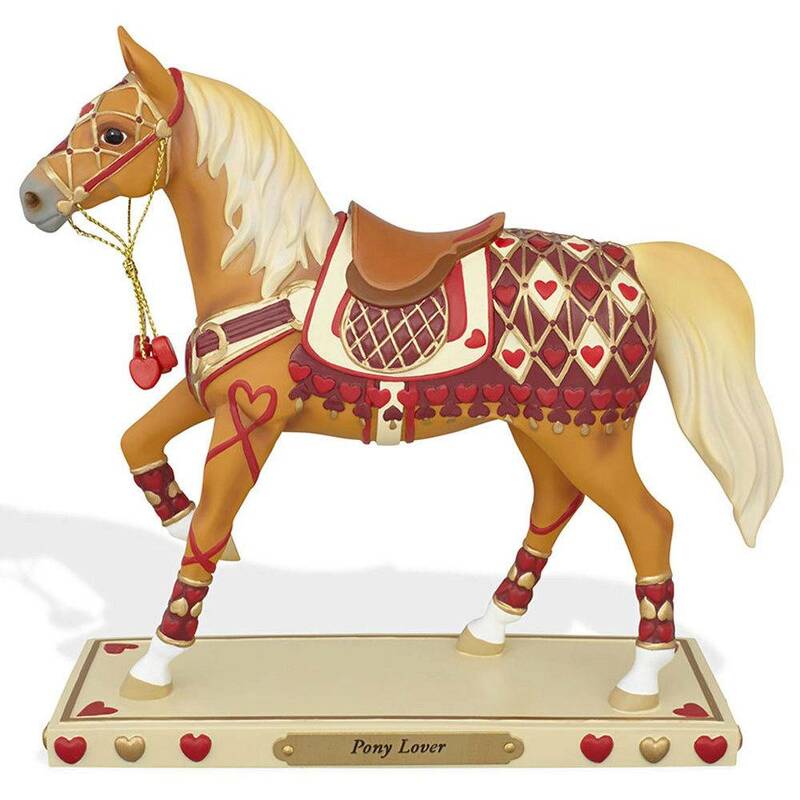 Pony Lover is brightly colored for any special occasion. Made of Resin. 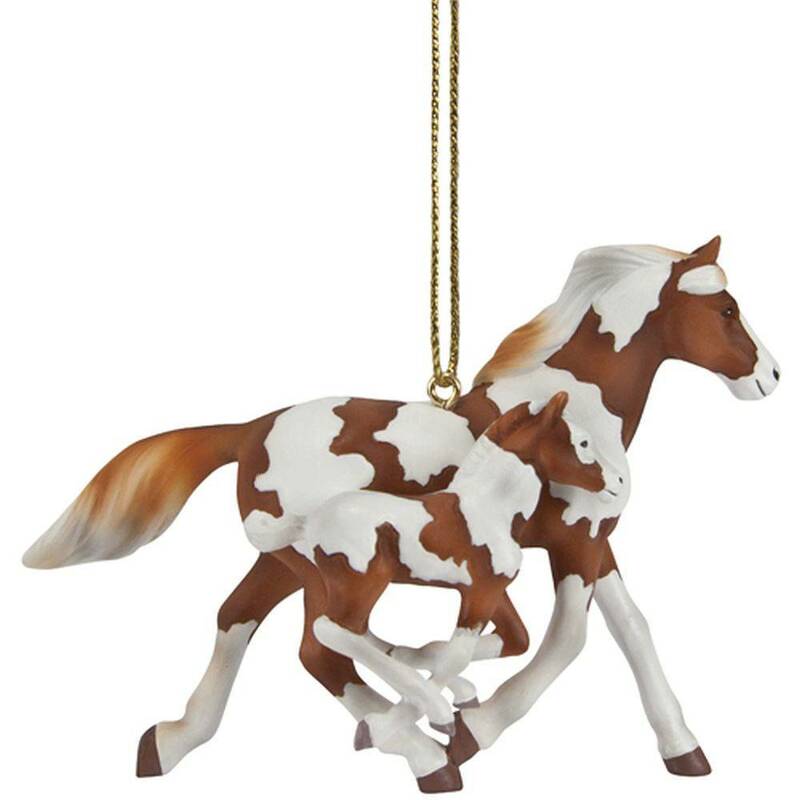 Painted Harmony Ornament is made by Trail of Painted Ponies. War Paint depicts the powerful magic was passed on to a warrior during the application of war paint to a horse in preparation for a forthcoming battle, and the hand print symbol was believed to channel strength and energy to the wearer, as well as to intimidate enemies. Made of Resin. Empress of the Wind brings you this lovely figureine. They say that the winds are like a woman, always changing. There are the Winds of Time which span history and the Winds of Change, which mark transformations. Made of Resin. 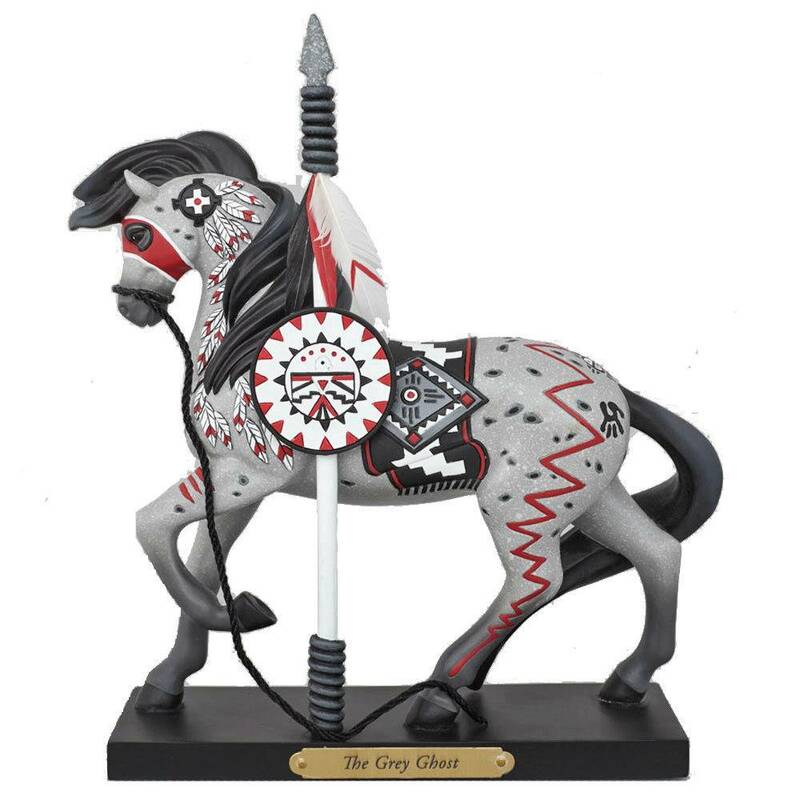 The Grey Ghost tells the story of a little known Native American legend, a mighty stallion, recognizable by its grey and black coat and red and white adornments, that sometimes appears galloping across the western skies as a warning of turbulent weather ahead. Made of Resin. 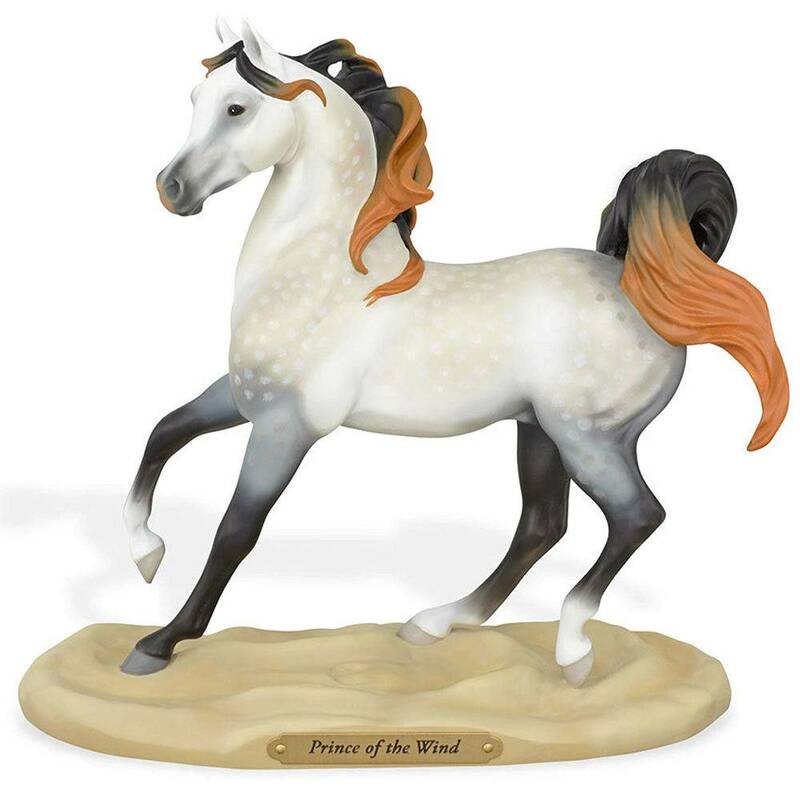 Prince of the Wind is a story told, when Sky and Earth gave birth to a royal son they endowed him with the power to fly without wings, the ability to dance without music, and the endurance to rule over the vast Arabian desert. Last of all, they painted his nature with beauty and grace, before enthroning him as Prince of the Wind. Made of Resin. 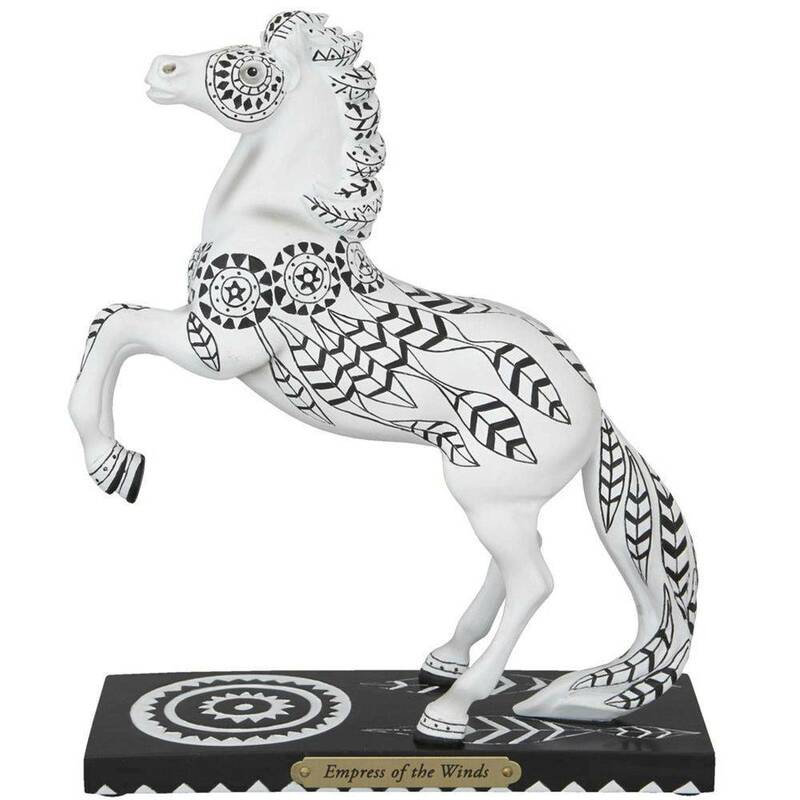 Prince of the Wind Ornament - As the story is told, when Sky and Earth gave birth to a royal son they endowed him with the power to fly without wings. Made of Resin. Children's Prayer for the World shows that there could be no more important messengers of peace than children of many faiths, from all around the world. Made of Resin. 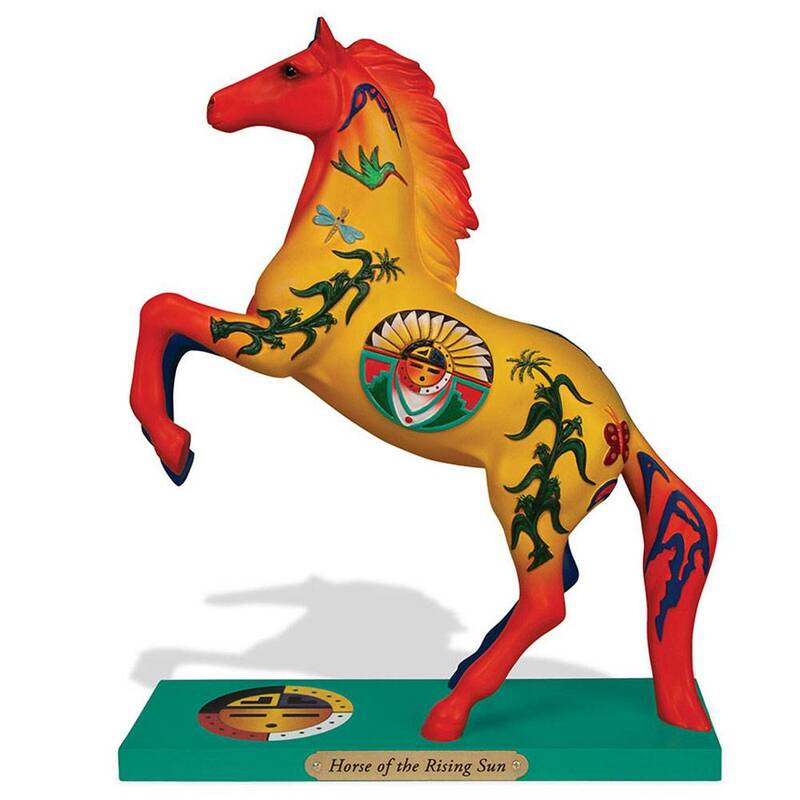 The Trail Of Painted Ponies Horse Of The Rising Sun is designed by an acclaimed Native artist from the Jemez Pueblo, in New Mexico, George Toya. He describes his work as part fantasy, part reality, and filled with narrative awaiting discovery. 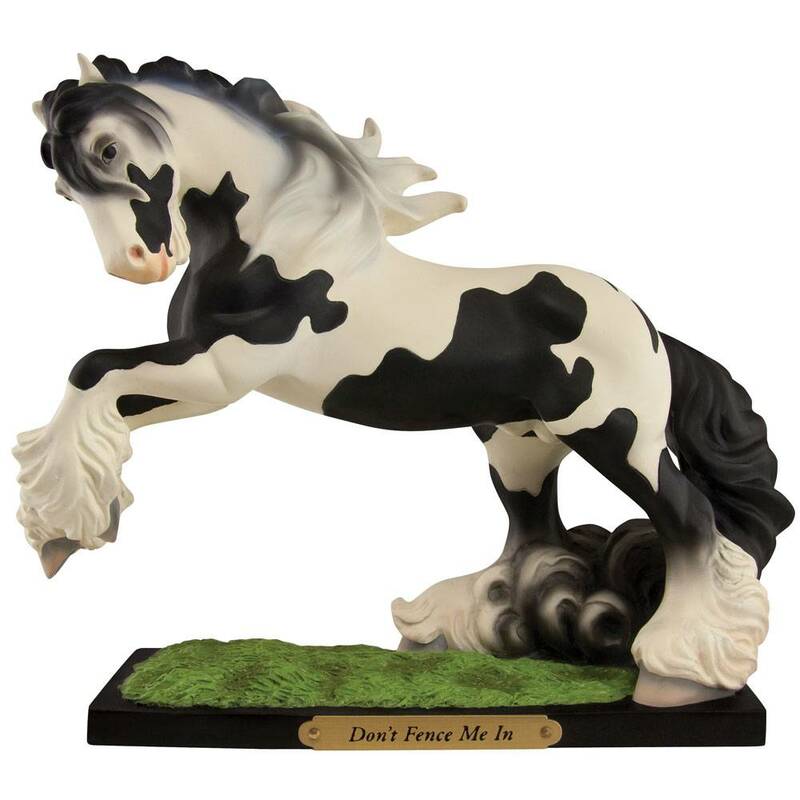 His Painted Pony depicts, on one side, the night with the stars, constellations, shooting star, and moon, with the North Star at the center so we never lose our way.On the other side he presents the day with different life forms, images and colors that represent beauty, and the sun at the center without which life is not possible. 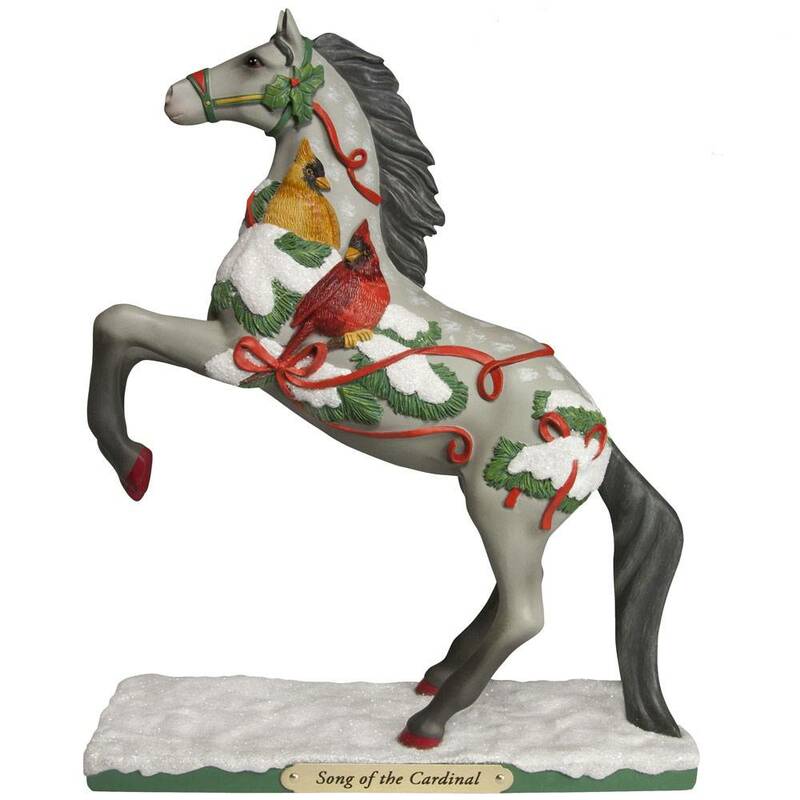 The Trail Of Painted Ponies Song Of The Cardinal. One of the more delightful holiday moments of this talented artist’s past - one that captured the beauty of Christmas for her and inspired “Song of the Cardinal” - is the memory of a scene glimpsed out a window on a winter morning, when two cardinals, a red male and a yellow female, joyous spots of color set against a somber gray day, perched on snow-laden evergreen boughs and sang to each other. 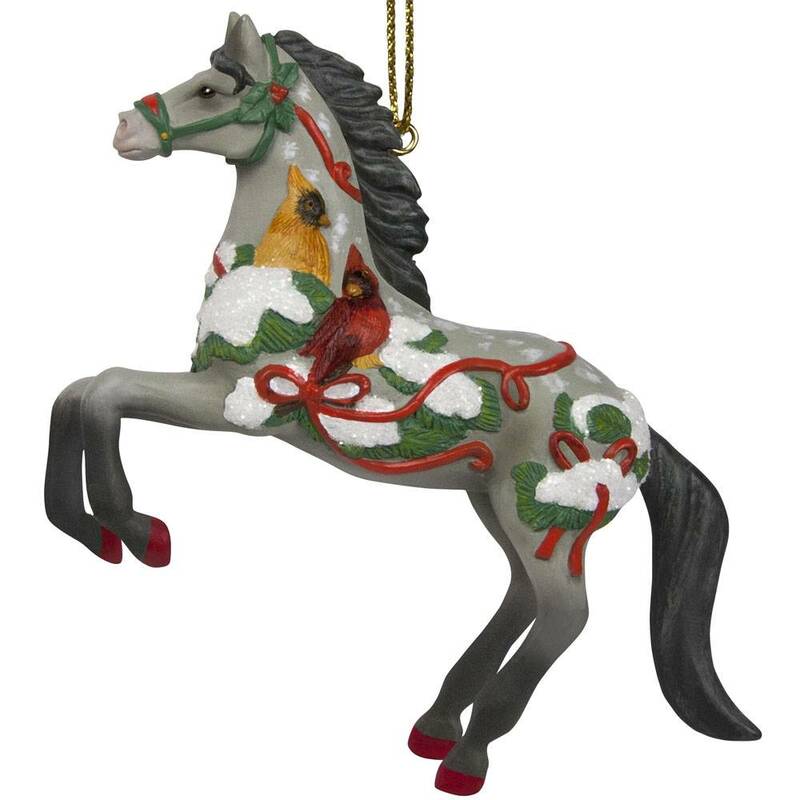 The Trail Of Painted Ponies Song Of The Cardinal Ornament. One of the more delightful holiday moments of this talented artists past - one that captured the beauty of Christmas for her and inspired Song of the Cardinal - is the memory of a scene glimpsed out a window on a winter morning, when two cardinals, a red male and a yellow female, joyous spots of color set against a somber gray day, perched on snow-laden evergreen boughs and sang to each other. Made of Resin. Size-3.2" high. 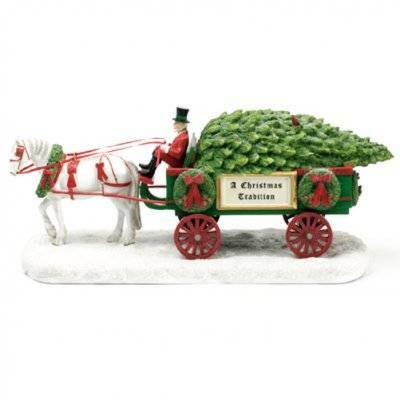 Sending Father Christmas to the forest to chop down the tallest, most perfectly shaped evergreen tree and haul it back to town in a horse-drawn wagon for a tree lighting ceremony, is a Christmas tradition that brings out the Yuletide spirit, and is celebrated in communities around the world. The centerpiece is musical and plays O'Christmas Tree. Made of Resin. 7 1/2" High. Sometimes the sweetest things are simple to say. 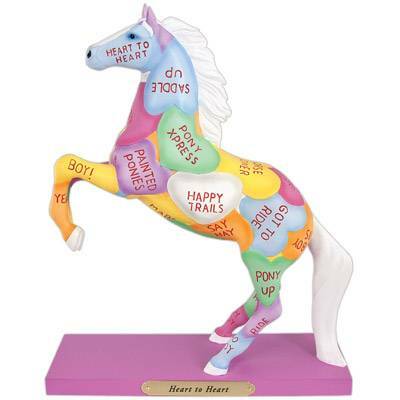 Painted Ponies hearts are colorful and will surely make your day. 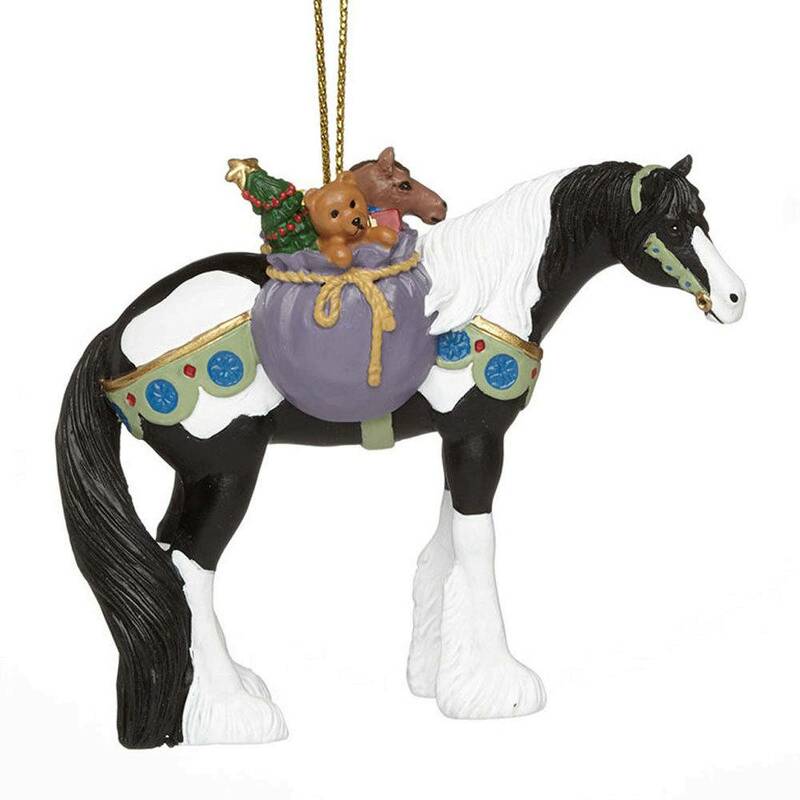 So share a thought and a smile with family and with friends, on this heartfelt trail ride where the fun never ends. Happy Hearts & Happy Trails! Crow Indians were renowned for colorful bead work and distinctive geometric compositions. They believed that sophisticated color schemes combined with triangular shapes projected sacred power and life. Yellow stood for the place of the suns rising. Rose for the early morning glow. Blue represented the sky. Astride a Pony like Regalia, a Crow Indian would have been a strikingly powerful presence as he rode across the open plains. In the Wild West days, frontier sheriffs who did not have access to badge manufacturers but wanted some means of identification that carried authority when they came up against dastardly villains, would sometimes cut stars out of tin cans. 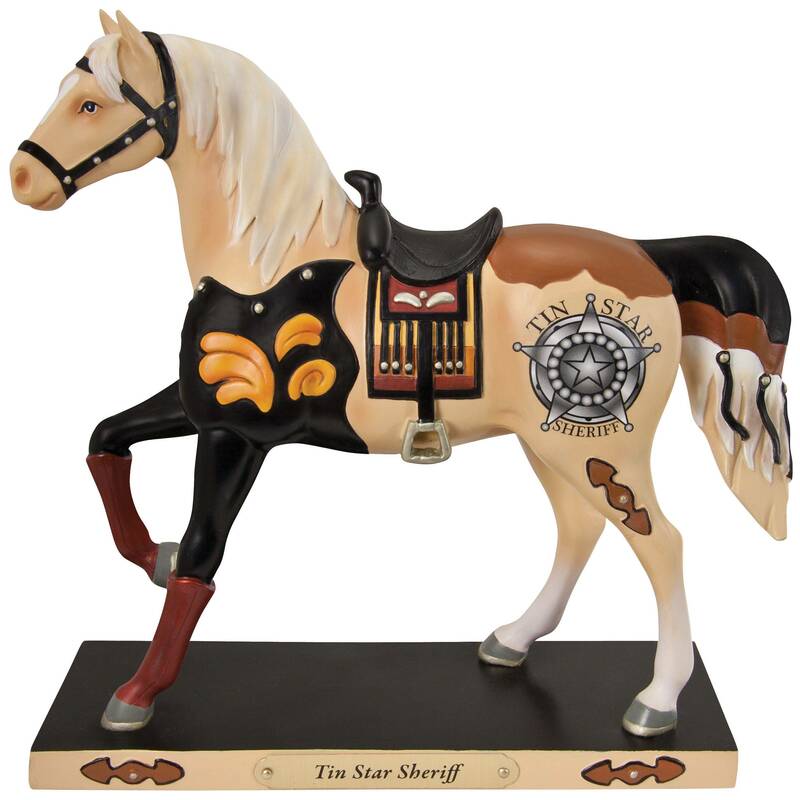 When added to fancy shirts with Old West styling, spangled buttons, and handcuffs that dangled like jeweled bracelets, these Tin Star Sheriffs not only kept law and order, they were the best dressed good guys of the Old West. 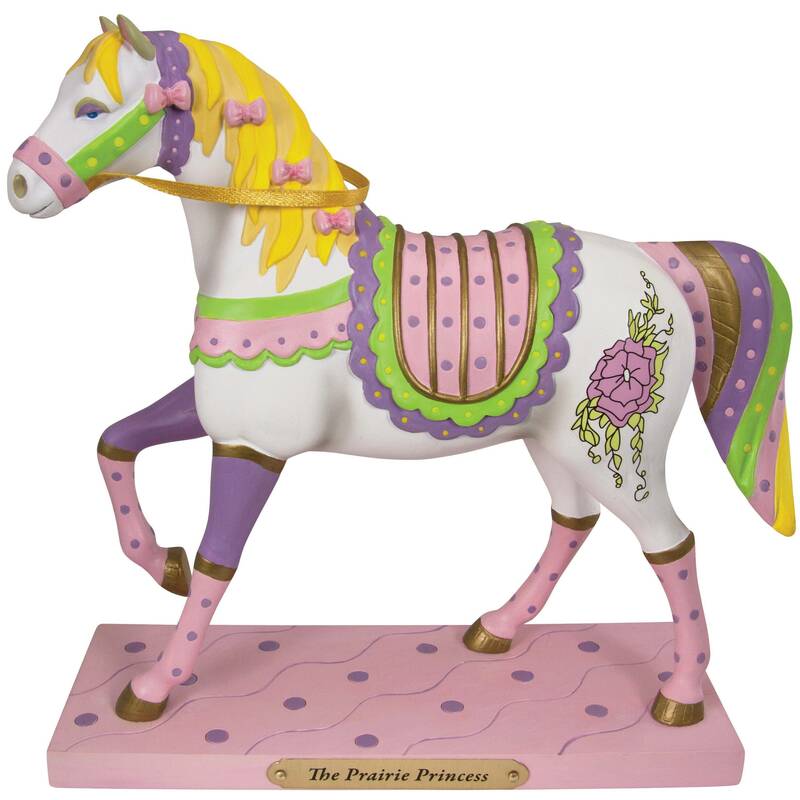 This Painted Pony, a co-creation of Pop Artist Howie Green and TV legend Alison Arngrim, whose portrayal of Nellie Oleson on Little House on the Prairie was so iconic she was named as the #1 female villain in TV history, is a tribute to the ladies who made their homes on the prairies of America in the 1800s. Those women were tough and sturdy to be sure, but always welcomed a little touch of color, and some decorative trim along a dress seam or a pink bow on their bonnets. 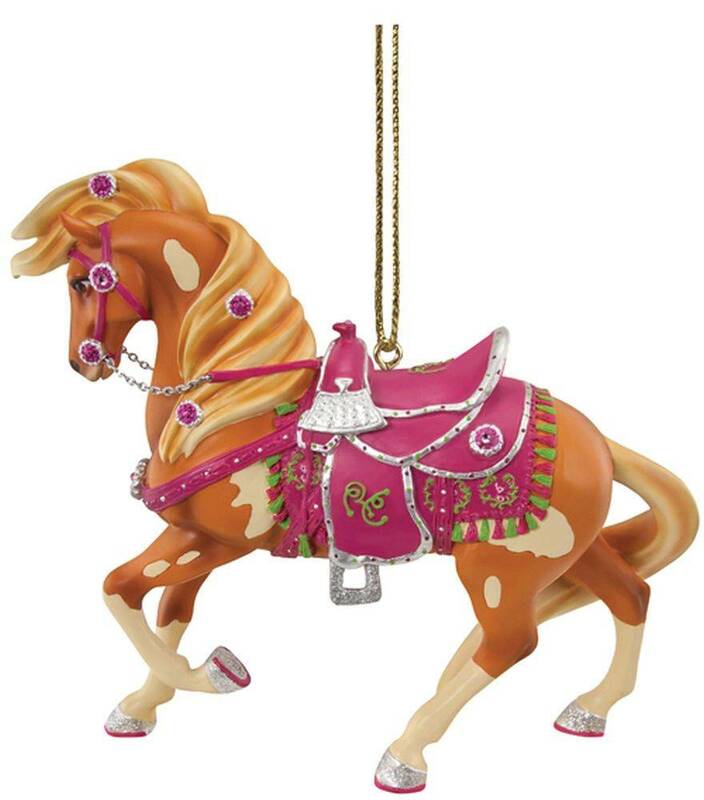 Painted Ponies Rhinestone Cowgirl Cowgirls know how to ride through life in style. Made of Resin. 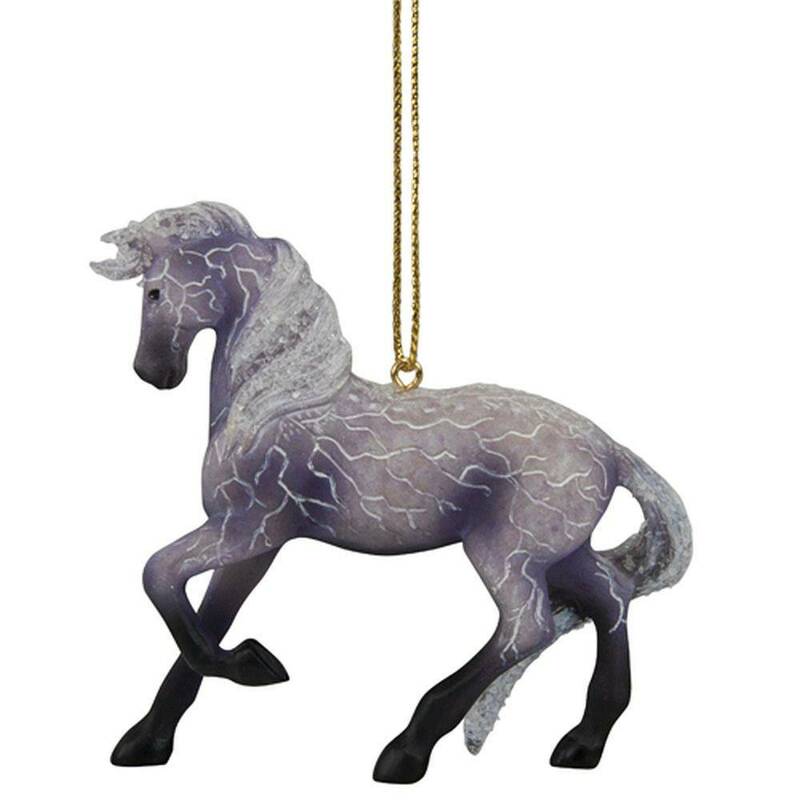 Storm Rider Ornament is made by Trail of Painted Ponies.